The majority of Americans polled say they are in favor of more border barriers — steel or concrete, it doesn’t matter to them as long as it helps stem the flow of illegals across our southern border. The experts — agents that patrol the border daily — unanimously agree it’s necessary. Americans living near the border are pleading for it. Elected officials in border cities like El Paso, TX, say it works and leads to reduced crime in their communities. For the families of those murdered, raped, robbed and beaten by illegal aliens it’s too late. Only Democrats — who only see future Democrat voters on the other side — say it isn’t required. Other than prospective voters, why are Democrats opposed to the additional 240 miles of wall when they advocated for it just a few years ago? What changed? Donald Trump! He drives their opposition. Trump made the “wall” his signature promise during the 2016 election. In relation to immigration it is important to his standing with his base. The Democrats are against it is because they don’t want to yield to President Trump or allow him any advantage in 2020. That’s it. 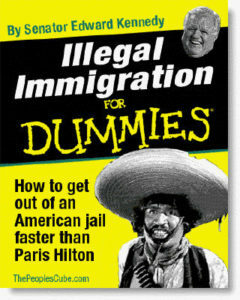 Screw the American people and the sanctity of our national borders. The Democrats are also intent on wanting every non-English speaking ragamuffin, anarchist, criminal, drug runner, unskilled, undereducated, and uneducated person from the Baja Peninsula to Soyapango to move here and be suckled at the taxpayers teat. 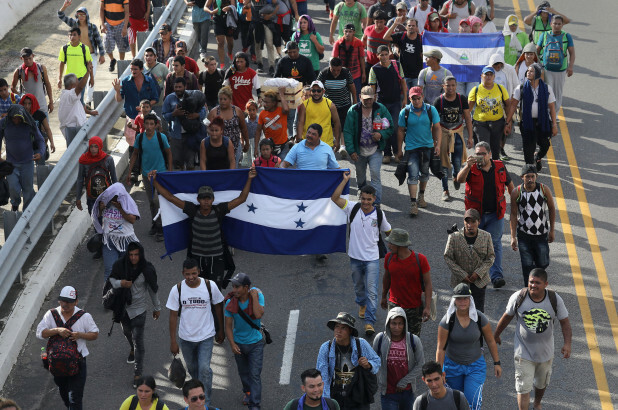 Another thing that puzzles me is how these caravan folks can proudly wave the flag of their home countries but consider it punishment to be sent back to them. Democrats claim they want border security. But to them the only “border security” they will support is liberal activists locking arms in a game of” red-rover” where illegal aliens are greeted with a sandwich, a pat on the back, and voter registration forms. Claims by Democrats that they support any form of border security are bold-faced lies. Remember, these are the same people that think Bruce Jenner is a woman. If nothing else the situation has put a spotlight on the country’s screwed up immigration policy making it harder to ignore. Something needs to be done….a wall, more barriers, additional border patrol agents, increased technology, all of it, — something, anything. Last week I sat and chatted with one of our City Commissioners at a local pub. His Democrat pal sitting next to him pooh-poohed the masses of immigrants storming the U.S. border in Tijuana, Mexico saying to me: “We have a big county with lots of room and they’re just a drop in the bucket.” When I suggested that without borders we don’t have a country, he shrugged his shoulders. Also buckets have a strange habit of filling up due to constant drips. 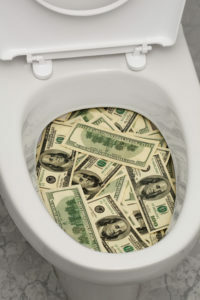 Our money flushed down the toilet. Those are just a small handful of the ways these hypocritical twits waste our money. The money they’ve squandered that could have already been used to help secure the border and includes the following absurd and wasteful nonsense voted on by both parties. Examples of this government waste and incompetence are endless. Yet, the Democrats are telling the American public the additional sections of the southern border wall are unnecessary and a waste of money. Do they think the American people are as dim as they are? President Trump illustrated the Democrat’s nonsense and hypocrisy Thursday when he sent a letter to House Speaker Nancy Pelosi informing her an upcoming taxpayer funded, military escorted trip overseas has been postponed. “Dear Madame Speaker. Due to the Shutdown, I am sorry to inform you that your trip to Brussels, Egypt, and Afghanistan has been postponed. We will reschedule this seven-day excursion when the Shutdown is over. In light of the 800,000 great American workers not receiving pay, I am sure you would agree that postponing this public relations event is totally appropriate. I also feel that, during this period, it would be better if you were in Washington negotiating with me and joining the Strong Border Security movement to end the Shutdown. Obviously, if you would like to make your journey by flying commercial, that would certainly be your prerogative,” President Trump wrote. The Drumming Doctor: When I was a kid I was extremely impressed with the skills of physicians and drummers. However, no matter how enthusiastic, a kid can’t just go out and start practicing medicine on his neighborhood pals. Music, yes. Surgery, no. The first time I heard a recording of Benny Goodman’s 1938 Carnegie Hall performance of “Swing, Swing, Swing” that featured drummer Gene Krupa’s tom-tom drum interludes, I was hooked. 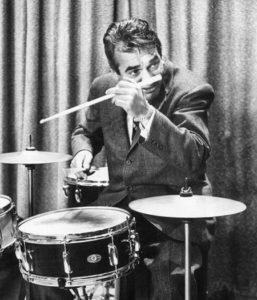 And after hearing the Buddy Rich-Gene Krupa “Drum Battle” recording and repeatedly playing Cozy Cole’s 45 rpm recordings of “Topsy I” and “Topsy II” I was convinced that percussion instruments were in my future. Don Templeton, a patient and kindly drum instructor suggested otherwise. After a few lessons he bluntly told me what the girls at my high school dances had been implying when they limped off the dance floor: “David, you have no sense of rhythm.” Mr. Templeton suggested that we save my mother’s money and that I explore another field where I might be more apt to succeed…..because playing a musical instrument wasn’t it. Neither was medicine. However, to this day I’m still impressed with drummers and physicians, and that’s why I stand in awe of local Fernandina Beach resident, Hal London, an accomplished medical practitioner and drummer in the Honey Badgers, a wildly popular local band. The 59-year-old doctor/drummer, who was born in Baltimore but spent most of his teen years in Philadelphia, started drumming at age five and played in his high school orchestra. He spent a number of years taking drum lessons studying with some famous drummers including Philly Joe Jones who also played with the Miles Davis Quintet. He says Ringo of the Beatles was one of his first inspirations. However, professional drumming wasn’t his chosen career, medicine was. A native of Baltimore, he graduated from Drexel University 1982 and then the Philadelphia College of Osteopathic Medicine in 1987. He practiced Emergency Medicine training in the Air force, then Georgia and Florida as an emergency medicine doctor for almost 30 years. But he admits, that unlike his musical interests, he almost gave up medicine. 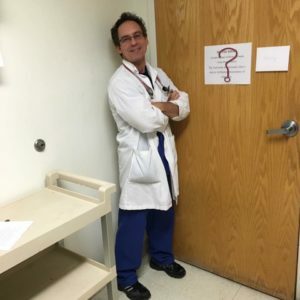 “In 2013 I was working as medical director of emergency medicine in a small Georgia hospital but after 28 years as a board certified ER physician I sadly realized I’d lost my love for the practice of emergency medicine,” he recalls. He says that because hospitals are businesses he was concerned that their focus on the financial side was approaching or exceeding the concern for patients. He said as time went on he found himself spending more time sitting at a computer than dealing with his patients. He describes those troubling times saying: “I was encouraged to spend time documenting totally unrelated aspects of care of patients so that my services could be billed at a higher level of care.” That, he said, along with other issues were driving him to give it up. Malpractice risk, physician/nursing conflicts over control of patient care, and the long shifts and sleep deprivation of night shifts were also taking their toll. He found a way to rekindle his passion for medicine by moving into the cosmetic dermatology practice, a field he admired and enjoyed. Over time he limited his ER practice as his cosmetic medicine practice began to grow. He says the growth of his practice from 2013 to present has far exceeded his expectations. “My patient roster is consistently growing and my passion for medicine has never been stronger,” admits the enthusiastic physician/drummer. 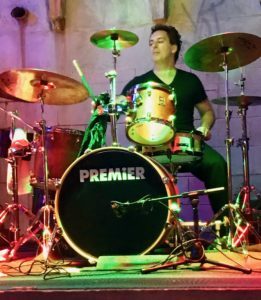 Today the affable doctor has combined his passions for both medicine and music, with his London Medical Spa at 19 South 6th Street in downtown Fernandina Beach and as the drummer for the wildly popular local Honey Badgers Band. 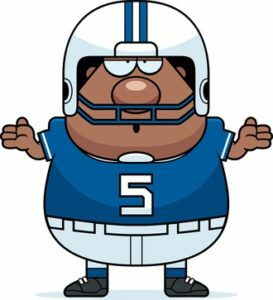 Run This Up The Flagpole And See Who Salutes: Tampa Plant High School classmate, friend and very talented writer, Larry Thorneberry, penned a January 2 American Spectator response to the vast number of NFL penalties experienced this season that I thought was more than worthy of reprinting here. In it Larry says: “It’s not just me. My impression has been confirmed. There has been a flag-storm in the NFL this year where a record number of flags were thrown and penalties assessed over the regular season just ended. The new record is somewhere between 3,447 and 3,472 flags, depending on which report you believe. No wonder so many NFL zebras had to be treated for exhaustion after games this fall. No reports yet of officials having to undergo Tommy John surgery from all that flag-throwing. But at this pace it’s just a matter of time. Drinking, Dining & Dancing: Last week Linda and I met a group of friends at the The Principal’s Office, the bar located in the restored school house boutique hotel lobby that is now called the School House Inn at 914 Atlantic Avenue in the beautifully renovated 1886 school. The lobby bar is attractive, comfortable, cozy and expensive and would be more inviting if it had carpets or wall coverings to help baffle the noise. Maybe they aren’t looking to attract locals with $5.00 12 ounce Bud Lights and glasses of wine at more than $10 each and there is no food or snacks. The 17 rooms range in price from $165 to $375. I suspect they’ll fill up on special occasions such as Shrimp Festival, the Concourse, etc. but doubt it’ll be a local hangout, which may be their objective. The 11th annual Restaurant Week (Jan. 18-27), a 10-day culinary showcase featuring culinary events and fixed lunch and dinner menus at a wide selection of the island’s wide range eateries started today. Lunch options are $12 per person and include an entrée, side and a non-alcoholic beverage, while the dinner options (priced at either $21, $31 or $41 per person) include three courses and a beverage. Some 30 of the island’s restaurants are participating in this year’s Amelia Island Restaurant Week, providing fixed menus for either lunch, dinner or both. 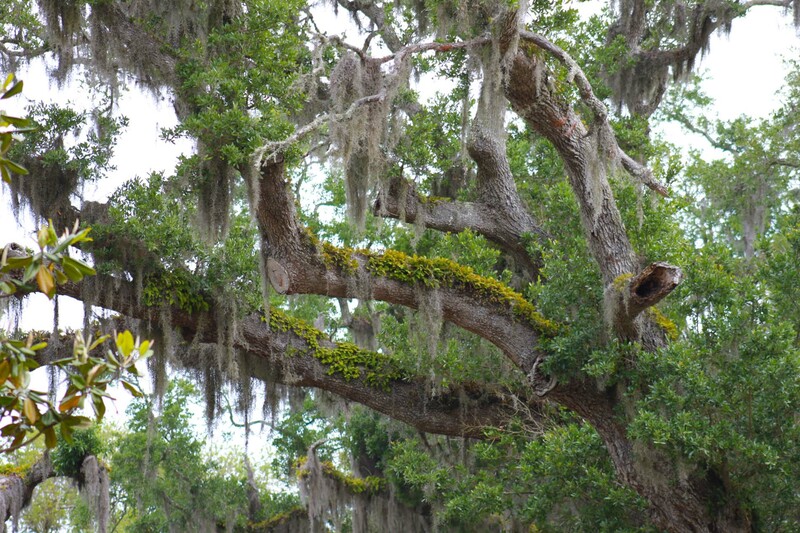 A listing of participating restaurants, menus, and special event information can be found at www.ameliaisland.com/yummy. Totally agree on Beef O'Brady's. Local politicians are focused on right whales, beach trash, paid parking - when they ought to be focused on Beef O'Brady's. The politician who runs on a "bring back Beef O'Brady's" gets my vote!! Our country is facing yet another paradigm shift effecting our current workforce. Artificial intelligence, robotics, and digital manufacturing are all converging. You can no longer expect and enjoy a middle-class lifestyle with just a strong work ethic as immigrants did at the turn of the last century when factory work was abundant. At a minimum a high school and trade school education is needed to participate in today’s US labor market. The question no one seems to want to politely discuss is what is to become of the uncontrolled influx of low skilled or unskilled labor facilitated by the “no border mentality” of many politicians and whether our economy (and we tax payers who voluntarily support our many government entitlements) are willing and can overcome the crisis. PS: and for those who go to bed early, regarding the Buzzfeed “Trump told Cohen to lie to Congress”, story… Mueller has issued a rare statement disputing the report. Wow, commenter Thornberry stated the Right Wing's whole case: anti bike paths and high speed rail...both communist conspiracies. He is right, all the Dems want are our social and community programs for America and we will be happy. Genius! The$5billion wall is a wonderful idea. Keep Mexicans out and our nation is safe. Terrorists will not figure how to get in, because Pres. Trump built it, Genius! Now we can pay our "non-essential" Coast Guard, TSA, FDA food inspectors...and most importantly our IRS employees giving our tax rebates, not least of all for the Trump voters and the rest of who need to get out tax money back. Yup , he's trying to hold us hostage to the Wall-for-Federal employees pay until we as a nation kowtow. Your President is a really great guy. But, it's a stupid and foolish call to try to extort the nation into paying for the El Chapo tunnel bypass of the wall, at the expense of our "non-essential" Federal employees. BTW, a 30' extension ladder and a rope for the other side will be an easy defeat to the $5 bilion wall. Maybe most wall supporters think a ladder won't work, but maybe if they got in shape, got off the sofa, they will realize getting over any wall is doable...and as such, a waste of money...stupid is as stupid does. Hey Dave, what’s the problem ? Everyone knows that Trump will get his wall when Mexico pays it. Quite right, Dave, to gig the Resist Party for its unceasing efforts to ensure a brisk and a continual flow of undocumented Democrats from south of the border. But I think I know a way we can hustle Chuck and Nancy's band of merry madcaps into voting for the wall. Tell them today (with fingers and toes crossed, of course) that we'll put a bike path on one side of the wall and run high speed rail down the other. The money will be on the table tomorrow.